A casino refurbishment is generally done with the minimum of fuss and bother for customers; the most commonly improved or upgraded areas are carpets, soft furnishings and light fixtures, which of course all make a significant visual impact on a customer when they first enter the property. Keeping inconvenience to a minimum is vital, but making the most of the changes is also important. It’s a selling point, it shows your customers that you care and that the operation is re-investing in itself and by extension, its customers. The UK’s Broadway Casino, in Birmingham, listened to its poker players when they asked for a private room for big games. Poker has been a major part of the casino’s offering since it opened in 2005, and it quickly became a hit with local, national and international players. When those players spoke, Denis Dowling, MD, Clockfair Ltd (which owns the Broadway Casino) and Charles Griffin, GM, Broadway Casino, listened – and then told Casino International how the casino’s gaming floor has evolved and about the casino’s ethos. Casino International: You refurbished a couple of years ago, but prior to that had a private poker room put into the main gaming room. What happened to that? Denis Dowling: A few years ago we introduced a secluded private poker area, which was at the request of our regular high-end poker-playing customers. But typically, as soon as we erected it – and it was very nice – they realised they missed the atmosphere of the busy main card room. We were not convinced it would work, but we wanted to look after our customers. In space terms, we lost one table from our offering of 16 poker tables in order to accommodate the new private room. Charles Griffin: Players wanted privacy, their own private, secluded area. But because they were boxed away they felt they had lost a lot of atmosphere. They felt left out of the buzz on the gaming floor. The high-end poker area had a single table at the rear of the card room, four metres by five metres, so room for one large table and space for someone to walk around the table. One other thing we have done with the poker room, aside from bringing it back to the main casino, is to drop some of the tables on to the gaming floor. The ten tables we originally had in the card room were not sufficient to meet demand and we needed extra. If we have a competition now we could have 25 tables but we regularly have 18 tables running. DD: The big thing now is we regularly have five or six cash games a night. Cash game players do want to be just a little separate, so we start from the gaming floor and fill those tables, then come up into the card room area. CI: When did the larger refurbishment happen? DD: Just over two years ago; the poker room change was made before the overall refurbishment, which involved new carpet, redecoration, a change of lighting, plus more TVs for sport and competition monitors. As part of the refurbishment, we also made another significant change. We started doing corporate events; some customers had asked about private parties and did we have a private room. We wanted to create something in line with our whole ethos of everything being visible, so we created a new bar area with two-way glass – if you want privacy you can switch the glass to opaque but if you want a party atmosphere, you can have it see-through. It works really well. CG: Prior to the refurb we had done events in that bar, but because it was such an open expanse it was difficult to make events private, so we looked at how best to cater for such events. DD: It was a main thoroughfare for people coming in to the casino, so though people wanted to use it, for a private party it didn’t quite work. CI: Were there any changes to the mix or number of games in the refurb? DD: We changed the electronic games because historically we were always with TCS. All different companies came to us but the products were not the standard we wanted – then Inspired came to us with the Sabre terminal, we liked them so we have gone 50/50 on the floor with them. It’s an evolution, and it has been very successful. Historically we have always been avant garde. We were the second casino in the country to have Touchbet terminals. We are and always have been willing to trial new products that we think would suit our customer profile. Initially we had a lot of IGT slot machines, then we took Novomatic’s Super Gaminator, now we have some Dominators too. CI: Are there any changes made since the refurb, where you have improved or streamlined something further or changed it since? DD: Not really; it’s an ever-evolving thing. We might make changes if there are changes to the Gambling Act. The footprint is 23,500 square feet, but if we were given parity with the 2005 Act casinos and could have more slot machines, we could have sports betting… we would look at the space we have and reorganise. I’m surprised the industry hasn’t challenged the Act already; there is a European precedent for it. Two types of industry supplied similar product where one was VAT applicable and one wasn’t. The one that was VAT-able argued they were offering the same service and they won the case. My thoughts are, if you look at the criteria for a large casino under the 2005 Act, you must have approximately 7,500 square feet, with 10,000 overall for gaming and non-gaming areas. We would qualify for that so why are we restricted to 25 machines and no sports betting, when a 2005 Act casino can provide that. We are offering the same service, we are doing the same thing. CI: Did you stay open during the refurbishment? DD: Yes. It took around four months to complete. CI: Did you use the refurbishment as a marketing story, to generate publicity and new visits? DD: Some of our competitors have spent a lot of money on publicity; we prefer to operate in a different way. With the private room, if it’s hired by a couple of regular customers, everyone they invite sees what we can do; they are advertising for us. CG: We are getting repeat business that way, from people that have been guests. It’s working very well for us. CI: Do you do much in the community to both help local organisations, and to raise your own profile? CG: We are out at least once a month at an event with our ‘fun casino’. That might be with the ICC supporting a charity event at Edgbaston [cricket ground], the Blues’ ground [Birmingham City] or even in social clubs. If it’s a cause we think is worthy of the support, we will try and be a part of it in some way. 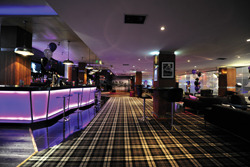 The fun casino brings an extra element to a charity event, it adds to the enjoyment and keeps people there for longer. CI: Have you had any issues as an independent operator in a city with so many established casinos which are part of large chains? Have any casinos closed in the area since you opened? DD: No. I think we have created something that wasn’t here before. We’re not about a quick hit, we’re more like a private club with gaming. If you look at our layout, the gaming is not in your face. You can have a drink at the bar, enjoy a meal – and game if you want to. We also pride ourselves on our customer service, and in fact have just received a certificate of excellence from Trip Advisor. Also, from day one we had all of our tables manned, so when customers came in they knew all of our games would be dealt. It didn’t faze us, coming in to Birmingham. We knew there was a market for the type of operation we were looking to put in to place. The Broadway Casino recently received a TripAdvisor Certificate of Excellence award to recognise ‘hospitality excellence’. The award is only given to establishments that consistently achieve outstanding traveller reviews on TripAdvisor, and is extended to qualifying businesses worldwide. When selecting Certificate of Excellence winners, TripAdvisor uses a set of rules to determine the honorees that takes into account reviews ratings. Businesses must maintain an overall TripAdvisor bubble rating of at least four out of five, volume and frequency of reviews. Additional criteria include business tenure and popularity ranking on the site. Charles Griffin, GM at Broadway said: “We are thrilled to have been awarded the TripAdvisor Certificate of Excellence and it’s testament to the hard work of all the staff here at Broadway Casino that we have achieved this.